Fire a laser at it! If you’ve ever seen a Star Wars or Star Trek movie, you’re familiar with the concept of a laser, a word that conjures images of fantastic sci-fi space battles. But lasers are no fantasy – they’ve thoroughly infiltrated everyday life, and are used in everything from barcode scanners and DVD drives to industrial cutting, surgery, and of course, scientific research. How do lasers work, and how do we use them in research? I’ll try to address those questions here. Truly we live in the future. Before I talk about lasers, I need to talk a little about light. Physicists use the term “light” to refer to all electromagnetic radiation, which includes the visible light that we see as color, but also things like radio waves, microwaves, and x-rays. Light behaves both like a wave and like a particle, and the individual light particles are called photons (the idea of light as particles originated with Einstein, and is actually the work for which he won the Nobel Prize). 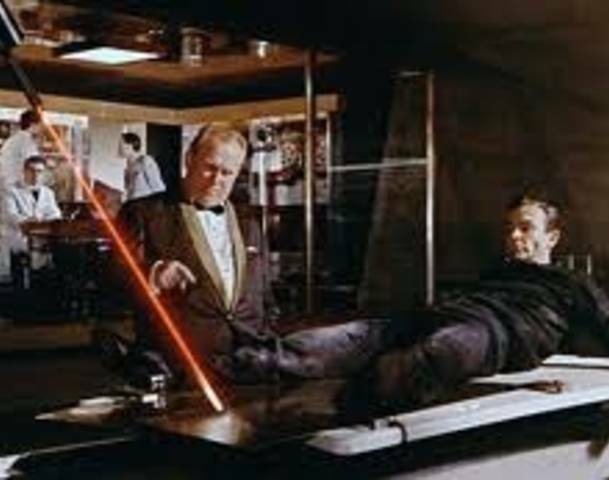 The word “laser” originated as an acronym, standing for light amplification by stimulated emission of radiation. Essentially, lasers consist of an energy source, a gain medium, and an optical resonator. The gain medium is what makes it possible to generate the laser beam and determines the color of the light produced; this is what people are referring to when they say, for example, “HeNe laser” (say hee-knee). In that case, the gain medium is a mixture of helium (He) and neon (Ne) gas, which produces a red beam. Lasers can be made with many different gain mediums, including dyes, gasses, and solids. First, the energy source generates the first few photons to get the laser started. The photons pass through the gain medium, and each photon interacts with the medium and has a chance to produce another photon traveling in the same direction as the original. This is why the word “gain” is used, because you start with one photon and end up with two. Finally, the optical resonator – at its simplest a pair of mirrors at either end of the laser – passes the photons back and forth through the gain medium, so that each photon produces many additional photons before escaping the resonator. This process results in a steady stream of highly coherent photons. Basic design of a laser – in this case, the flashlamp provides the energy source, the Nd:YAG crystal is the gain medium, and the two mirrors form the optical resonator. The feature that distinguishes a laser from other light sources is the laser’s coherence. Unlike, say, a light bulb, a laser produces light that is almost completely the same color. 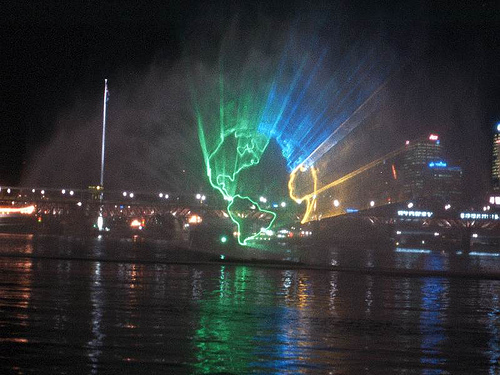 (The color of light is determined by its wavelength. Wavelengths of visible light range from about 400 nm to 750 nm – see Andy Berger’s post for an idea of how small that is.) Lasers can be made with a wide variety of wavelengths, ranging from 150 nm to over 1 mm. Different applications have different wavelength requirements – for example, optical disc drives use lasers to read information off of CDs, DVDs, and now Blu-ray discs. The reason Blu-rays can store more data than CDs or DVDs is because the laser used to read the disc is blue, hence the name. Specifically, Blu-rays use 405 nm light, while CDs and DVDs use 780 and 650 nm respectively. 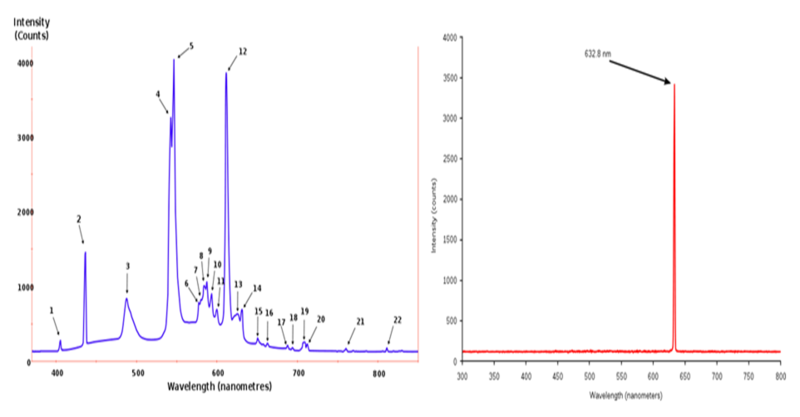 Spectrum produced by a fluorescent lamp (left) and by a HeNe laser (right). Lasers also produce spatially coherent light, by which I mean a laser generally sends photons only in the direction it is pointing. The light from any source will spread out, and lasers are no different (and different lasers will spread at different rates). However, the beam from a flashlight or spotlight will spread out much more quickly than a laser, and we can use various optics to make a laser beam spread very little over long distances (a process called collimation), something that’s only possible because of the laser’s coherence. Even a spotlight is only visible from up to a few miles away, while you could aim an ordinary, well-collimated laser in San Francisco at the Empire State Building and the spot would be maybe a single story tall, so still easily visible (assuming you didn’t hit any mountains along the way). A side effect of this is that you should not be able to see a laser beam if you are not looking right down the beam path, as there simply isn’t any light for your eye to see. When you can see the beam, it’s because some of the light is scattering off particles in the air. There are a wide variety of measurements you can do with a laser. In our lab, we have a titanium-sapphire laser (Ti:Sapph) that can output about 2 watts of power. We use our laser to investigate different materials properties – one of the basic measurements we do is to just hit a sample with the laser and see what light comes back out. Another measurement that I do is to reflect the beam off of a sample to do a sensitive measurement of its magnetic behavior. The inside of our laser (left) and the optical table in our lab (right). You can see the table has a grid of holes that we use for a variety of equipment, most commonly lenses and mirrors to focus and steer the laser beam. Something we have to keep in mind is that the absolute power of the laser is often not as relevant as the power density. We can focus a laser down to very small spots (about 100 microns in our lab), so the amount of power the laser delivers is also focused into a small area. It’s like using a magnifying glass to start a fire, a staple of survival movies. A typical incandescent light bulb consumes 60 watts of power, which it converts into light and heat (an incandescent bulb is actually much better at producing heat than light). If a laser output that much power and was focused to a 100 micron spot, the power density would be high enough to cut through steel (I have a couple of shirts with holes in them from laser damage). It’s hard to believe that when they were invented, lasers didn’t have any obvious purpose – they were a solution in search of a problem, a toy for scientists to play with. Today, they’re widely used in both commercial and research applications, from more mundane uses like laser pointers to out-of-this-world uses like igniting nuclear fusion. It just goes to show that as a scientist, you never know when the experiment you’re slaving over could someday affect the lives of millions of people around the world. 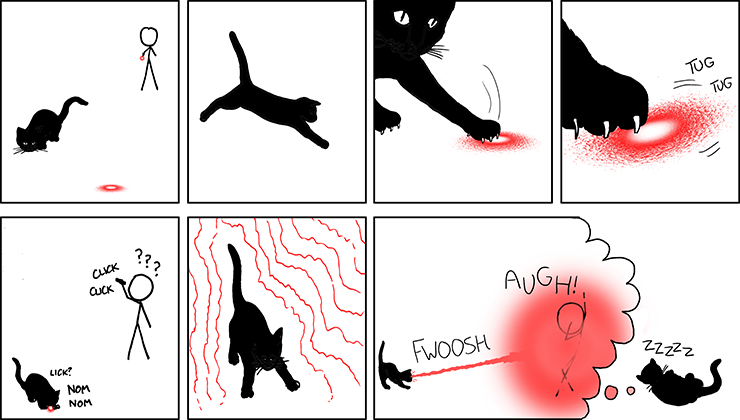 Or lasers can be used to play with cats. 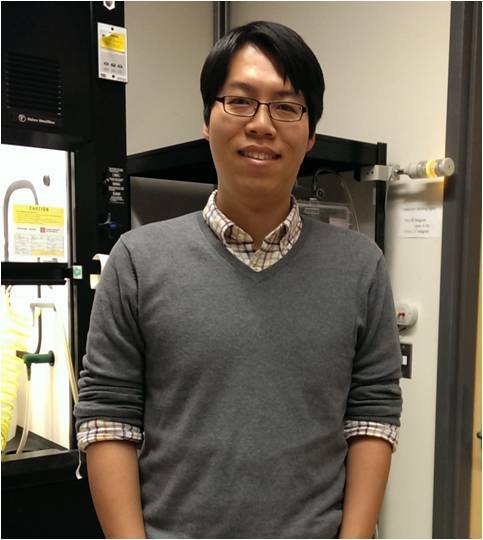 I’m a senior graduate student in Professor Zeke Johnston-Halperin’s lab at OSU. I was born and raised in California, but chose to come to Ohio anyway. In my free time, I read a lot of books, watch a lot of movies, and play soccer and basketball. After graduating, I hope to work in public policy.